VANCOUVER, B.C. 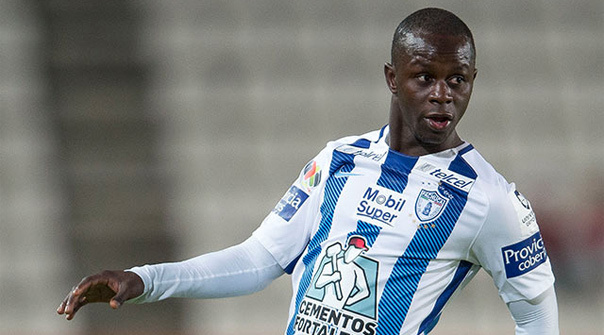 - WErstwhile Vancouver Whitecaps FC winger, Kekuta Manneh is back in Vancouver this week following the 2018 Clausura with C.F. Pachuca in Liga MX. Manneh has been staying in shape and working on his fitness while training with the Whitecaps FC. The 23 year-old Manneh signed with C.F. Pachuca on December 26, 2017. He made one appearance playing 8 minutes as a substitute. It's not been the smoothest of transitions from Major League Soccer to Liga MX. C.F. Pachuca finished 6-6-5 in Liga MX Clausura missing the playoffs by one point. "It wasn't the greatest." Manneh told RedNation Online earlier this week. "We struggled as a team, and me individually getting minutes. It was good, at the end it was a good learning experience. The altitude was a big factor for me. I couldn't get adjusted to that, so it took me a while to feel comfortable, and by the time you know it, the season is over, and we have to get ready for the next tournament. As a whole for the group, it wasn't good enough because we didn't make the playoffs." Happy to made my Liga MX debut tonight. Not the result we wanted but we get ready for next one. There's always an adjustment period, new challenges, and some hiccups along the way. Following his trade from Vancouver to Columbus on March 30, 2017. There was speculation that Manneh had his heart set on Europe. While he had a trial with FC Union Berlin, it was C.F. Pachuca that came though. "I've known from people around, they've been interested for a long time." said, Manneh of C.F. Pachuca. "I was free and I had to make a decision. I had a few teams interested, but Pachuca was the team that stood out to me the most. It was very interesting. A couple of other Liga MX teams were interested, but Pachuca was just an opportunity I couldn't pass up. When they came in, they had interest, it was a no brainer." Whenever he has the ball at his feet, and he's taking on defenders up and down the flank. That's when Kekuta Manneh is at his best. He has speed for days, and his game is suited for C.F. Pachuca and Liga MX. Despite not being able to speak much Spanish, it didn't take long for Manneh to figure out what Manager Diego Alonso wanted to see. "It's just very simple and plain." Manneh said, as he talked tactics. "They like to play one v one all over the park. You have a job as a winger. Just take the ball, run at the full-back, put balls in the box, crosses, take shots. That was the message to the whole team, and how we play. It was very simple, he didn't complicate it at all." There is uncertainty for Manneh and his teammates as C.F. Pachuca get set for the next clausura. Diego Alonso is out and won't be back as the gaffer. What exactly that means for Manneh's role, playing time, and long-term future is anybody's' guess. "I have no idea." Manneh spoke honestly. "I guess go back for preseason and see who comes back. We don't know. We all have to report back for preseason next month. Hopefully we'll see, it's a fresh start for everyone. We'll go from there." As he gets set to compete in his third FIFA World Cup with Japan, C.F. Pachuca striker, Keisuke Honda has made a huge impression on Manneh. Honda has played all over the globe, and know's what it takes to be a professional footballer day in, and day out. Anytime Honda is around, Manneh has a kid in a candy store approach. "Unbelievable, one of the best pro's I've ever seen. He does everything he can to get better. You can see him wanting to get better every single day. He's one of the best I've ever trained with or played with. Just the ways he does things. His mentality, and how strong he is, it's crazy. His production is unbelievable, he's either scoring a goal, assisting two goals, or assisting. Anytime you go and watch him, he's a bundle of joy. He's a good pro as well, and for me that's big. Sometimes you have an idea about someone, and then you see something different. He was that guy for me. He's not loud, very quiet. He talks to all the players and makes sure everyone is okay. His professionalism, for me is the best probably the best player I've played with. He's a great guy." It's a risk to leave your comfort zone and MLS was a comfort zone for Manneh. He's moved on to Liga MX with C.F. Pachuca and he's taking that next step in wanting to become a better and more polished footballer. Not many would take such a risk.